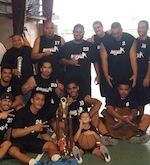 Fagatogo was crowned champions of the American Samoa Basketball Association's Sprite Summer League in the men's open division Tuesday, September 13, 2005 at the Samoana High School gymnasium in Utulei. They defeated Mesepa 86-81 behind the stellar play of Leroy Lutu, the championship game's Most Valuable Player as he racked up 52 points. In the third and fourth place battle, Uptempo defeated Auto prior to the championship match. All teams received trophies at the end courtesy of GHC Reid, the local distributor of Sprite. The next men's open league being planned by ASBA is a Shield League they hope to start on the first of October. The Moso'oi festival is in October and teams from Samoa have shown interest in coming over to compete in a tournament. According to ASBA president, Ed Imo, the Shield League will take a break on that week for a Moso'oi basketball tournament that will include those teams from Samoa wishing to participate. It is not known yet how many teams are coming over for the Moso'oi tournament. As for the girls' open division, their league begins on September 26, 2005. Games will be held at the Samoana High School gymnasium. No date has been set for the next men's 40 & Over basketball league.